CARBONDALE, Ill. — Calling all military service personnel – past and present – along with their families. 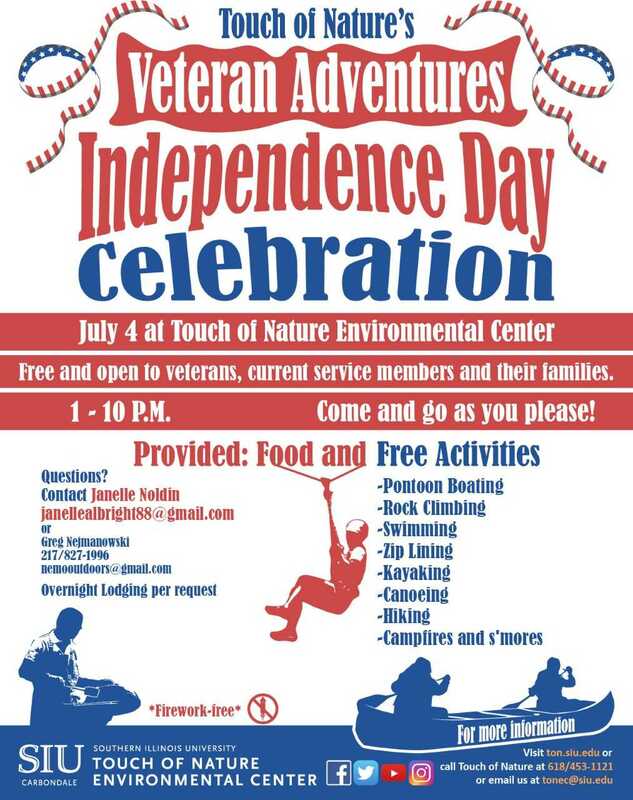 You are invited to a special Veteran Adventures Independence Day Celebration at Southern Illinois University Carbondale’s Touch of Nature Environmental Center. The celebration is open to all current military service members, all veterans and members of the National Guard, the reserves and the ROTC, in addition to their family members. Sponsored by Touch of Nature’s Veteran Adventures Program, the party runs from 1 to 10 p.m. at the facility located about eight miles south of Carbondale on Giant City Road. A wide variety of activities and food will be provided at no cost to participants. Those attending can spend all afternoon and evening enjoying Touch of Nature’s acclaimed amenities or come and go as they like. Organizers will facilitate sundry outdoor activities, including rock climbing, zip lining, hiking, canoeing, kayaking, swimming, pontoon boat rides and much more. The evening will feature a campfire and s’mores. Although there is no charge to participate, organizers ask that those planning to attend pre-register online by June 29 at www.ton.siu.edu. In addition, complementary overnight lodging is available upon request. 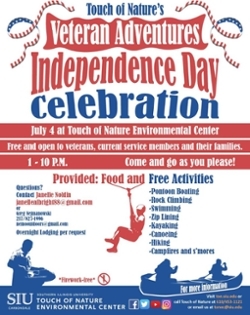 For more information about the Veteran Adventures Independence Day Celebration, contact Janelle Noldin at janellealbight88@gmail.com or Greg Nejmanowsky at nemooutdoors@gmail.com. Or, call Touch of Nature at 618/453-1121. 1-10 p.m., July 4, Touch of Nature Environmental Center, about eight miles south of Carbondale on Giant City Road. Free activities for all military personnel – past or present – along with ROTC, reserves, and family members. Pre-register online by June 29. For more information contact Janelle Noldin at janellealbight88@gmail.com or Greg Nejmanowski at nemooutdoors@gmail.com or call Touch of Nature at 618/453-1121.